CarFest South came for a second time to Laverstoke Park Farm but this year the hill climb was twice as long and some tricky turns were added to entertain drivers and spectators alike. A fairground, bouncy castle land and monster trucks were also added to build on the success of the 2012 event. Cars roared up the hill in groups of 7 with Chris Evans leading his new and improved 2013 line-up. 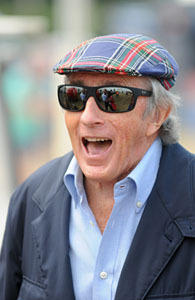 Special guests took to the track including Sharleen Spiteri in Chitty Chitty Bang Bang and Sir Jackie Stewart. Other riders included competition winners and lucky crowd members in the right place at the right time. One of the highlights of the event was when motor sport history was recreated. 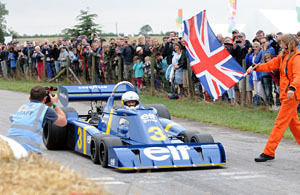 Jody Scheckter climbed back into the revolutionary six-wheeled Tyrrell P34 for the first time in nearly 40 years. It was in 1976 that the Tyrrell team introduced one the most radical cars ever seen in Formula One racing. The ground-breaking P34 was conceived by the team’s ingenious chief designer Derek Gardner. It broke with the conventional two front wheel design and instead featured four much smaller front wheels to give additional grip and downforce – a concept since outlawed by the F1 rule makers. Two cars were built for the team’s drivers Scheckter and Patrick Depailler to race in that year’s FIA Formula One World Championship. The P34’s landmark moment came at the 1976 Swedish Grand Prix staged at the Anderstorp circuit in June where Scheckter took pole position and then made history by becoming the only driver ever to win a Grand Prix in a six-wheeled car. Although that was the only win, in total the South African scored no fewer than ten top six finishes in the car from just 12 starts including second place finishes in Monte Carlo, Britain, Germany and America. Scheckter also wowed the sell-out crowds with blasts in his sweet sounding V12 Ferrari 312 T4 – the scarlet machine in which he won the 1979 World Championship title. Also, his son Tomas drove the Wolf WR2, the car in which his father won three Grands Prix en route to second place in the 1977 FIA World Championship. Jody – who was joined at Laverstoke by fellow F1 World Champion Sir Jackie Stewart – also revelled in driving a 355bhp Mercedes A45 AMG road car. Though not on the official schedule, Scheckter managed to sneak the A45 onto the straw bale-lined course on several occasions during the weekend. The hillclimb also featured a mouth-watering array of competition and supercars including an amazing selection iconic Gulf liveried racers from the RofCo Collection topped by the legendary Porsche 917 as driven by Steve McQueen in the movie Le Mans. Pink Floyd drummer Nick Mason provided some stunning machinery including his priceless Ferrari 250 GTO and equally evocative Jaguar D-type. Mason himself demonstrated several of these on the hillclimb course along with his son-in-law, sportscar racer Marino Franchitti, his wife, Nettie and their son, Cary. Another impressive sight took place on the Sunday. Aston Martin celebrated 100 years in style with 100 Aston cars on the hillclimb, led out by a police car to Bond music. Wackier cars taking to the track over the Bank Holiday weekend included a motorised bed, a Hot Desk and a garden shed which Olympian James Cracknell was spotted in. Waving the Union Flag away from the busy car paddock, the ‘Britain’s Best Pavilion’ was another hugely popular attraction giving some of this country’s best small producers a chance to promote and sell their jams, juices, breads, sweets, meats and much, much more. Hampshire producers included Yarty Cordials and Hampshire Charcuterie. Music was a big part of the event again and the line-up included Texas, Keane, Bjorn Again, Ocean Colour Scene, tenor Alfie Boe, Jools Holland, The Wurzels, Amy Macdonald and Scouting for Girls. There was also a surprise gig by Seasick Steve. The ever popular Cakes v Pies returned with Mary Berry and Paul Hollywood judging the culinary efforts of entrants on the Sunday. This year there was more than one competition with categories for children, grown-ups and professionals. The gluten free bacon & egg pie from My Mum’s Cakes won best professional pie but the answer to the big question ‘cakes or pies’ was definitely cakes this year. The top prize was eventually won by Alison McGurk from near St Albans for her Lemon and Passionfruit Crunch Cake which scored 100%. A new feature for 2013 was a live broadcast by Chris Evans on BBC Radio 2 on Saturday and he also did a live TV broadcast of The One Show. More entertainments came in the form of air displays (including the Vulcan), digger dancing, Bug Shows, bread making classes, ice cream making and butter churning. 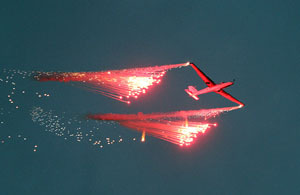 A spectacular appearance was made by Glider FX – their glider soared over the festival site with fireworks lighting the dusky skies. Festival goers were treated to a display on both the Saturday and the Sunday. The food did not disappoint. Fresh, organic food from the farm was available, including delicious ice cream for when the sun put in an appearance. With so much to see and do, CarFest is now firmly established as one of the summer’s most friendly and fun festivals.